At Click Suite we specialise in making boutique interactive and digital media for a range of organisations: large and small, public and private, commercial and non-commercial. 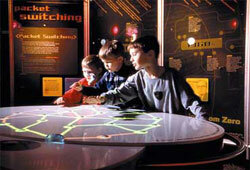 And often, we work with museums and visitor centres (again, of all shapes and sizes). • Open: ‘Decentralisation of’, ‘Participation with’ and ‘Contribution to’ collections by visitors. • Active: Curiosity / Play / Creativity by visitors is being fostered and encouraged. • Flexible: A better use of the physical environment and flexible interior design (spaces) that can easily be repurposed for events / workshops / exhibitions and community use. 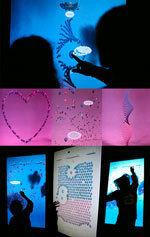 • Networked: Use of networks (community / digital / outreach) to spread an exhibition and experience. • Unique: Information aesthetics and data visualisation are being used (to enhance the display of items from within a collection and / or visitor response). • Pliable: Reframing conventional taxonomies (and disciplines) to include non-traditional ways to access and interact with collections, e.g. 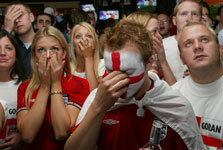 emotion, anecdote, personal vignettes etc. • Collaborative: Institutions are working together more to try and create exhibitions that are greater than a sum of their individuals parts (via combined collections, personnel etc). • Experimental interpretation: Learning by doing (as opposed to learning by seeing and being told) is an increasing trend. Wow. That’s quite an amazing fact. I’m ashamed to say I (naively) thought that tourists came to New Zealand mainly for scenery, ‘hospitality’ and extreme sports. However, I’m also pleasantly surprised. As someone who works on the periphery of the cultural sector, it’s a sector that’s clearly booming and that makes it an exciting time to be involved. We love working with public and cultural institutions such as museums, libraries and galleries because the content we encounter is always rich, diverse and interesting. Also, the people we work with in these institutions are generally very passionate about their work. They care deeply about what they do. They understand the importance of their organisations, but also, they are increasingly enthusiastic about how to expand and broaden their reach to a wider constituency of people (both New Zealanders and tourists). Digital technology is obviously a great way to do this. Over our fifteen year history we have been fortunate enough to work with Te Papa, the National Library of New Zealand, Puke Ariki, Petone Settlers Museum, the Ministry for Culture and Heritage, the Auckland Museum, the New Zealand Portrait Gallery, New Zealand On Air, the Film Commission, The New Dowse and other cultural institutions throughout Australasia. So we’ve learned some things along the way. We’ve seen that the way museums position themselves in the 21st century has changed dramatically since the last century, and of course, the centuries before. Today, museums (like everyone) are operating in a noisier, more crowded (market) space where the lines between cultural and commercial entities are becoming increasingly blurred. Public-private partnerships are frequently forged to fund exhibitions and spaces that would otherwise never happen. And it seems that the challenge to create a genuinely unique offering does seem to be getting harder and harder. Museums are often lambasted by the academic community for pandering to the ‘lowest common denominator’ and trying to turn ‘serious institutions into theme parks’, yet at the same time, museums need visitors to justify their existence (and funding) and maintain relevance in a world where attention is increasingly fragmented and diffuse. You may argue that museums have never and should never be purely about ‘bums on seats’ or ‘attention factories’, but rather, quality of experience, and I’d agree with you; but it doesn’t mean that popularity, ‘visitation rates’ and customer satisfaction surveys necessarily come at the expense of intelligence and integrity. Anyway, from where we sit, as people who work alongside cultural institutions, it’s relatively easy to make comments from the outside, where we’re free from the political machinations and complex needs of the modern museum. But for what it’s worth, here are some observations (from the outside, looking in – and in no particular order) about the issues that we believe could be improved or reconsidered (especially with regard to the use of digital media) to improve the museum offering. Of course, it’s a bit of a clumsy generalisation (and given the amount of work it takes to simply arrive at ‘opening day’, it’s understandable), but museum websites often feel like a bit of an afterthought. In some cases, however, they are a missed opportunity for the continuity or extension of an exhibition. Once visitors have attended an exhibition, they will almost always have some thoughts, impressions, feelings and opinions about what they saw. But frequently, visitors are out the front door and never seen or heard from again. Why not try and turn your ‘visitors’ into fans or advocates (or critics)? If they liked the exhibition, shouldn’t there be an opportunity for them to extend their interest and tell their friends, families and networks? Similarly, if they had a problem or issue, is there an online forum where these can be aired, debated or resolved? Websites (be they those of the museum, the exhibition or any of the many social media platforms available today) allow museums to turn their exhibition into an ongoing experience. As history tells us, if we take any topic such as Parihaka, Van Gogh or Westie culture and turn it into an exhibition – the 2009 interpretation and the 2059 interpretation won’t be the same. With digital media, we needn’t consign such events to the ‘previous exhibitions’ silo (if one even exists), but we can (and should) store and compare these competing viewpoints over time. A visitor is not a just passive recipient of an exhibition’s content. Museums and galleries have encouraged lectures, discussions, debates and tutorials for centuries since the first Library of Alexandria (and many continue to do so today ‘in the real world’). However, it’s easy to use digital media to extend and broaden the scope of these conversations. Obviously, when you discuss any cultural artefact (such as a film, book or exhibition) with a group of friends afterwards, you frequently get a lot more out of it. Museums have an opportunity to use technology to extend the reach of their exhibition, but this trend is something that we haven’t seen a lot of (to date). I sometimes sense that museums and galleries (especially) are reluctant to ‘give too much away’ online – perhaps the fear is that if all the exhibition content is freely and readily available online, nobody will actually bother to walk through the front door. I haven’t found any studies to prove or disprove this assumption (please let us know if you have one), but we know (anecdotally) that having Monet’s work freely viewable online doesn’t stop people from flocking to see his actual work in record numbers. I think the bigger issue is that institutions have an opportunity to form a relationship with visitors (online, especially, is an easy way to do this) beyond the occasional email newsletter. And it’s not simply about growing their customer database (that will please some people, not all) – but it’s actually about helping and motivating those who are inclined to find, create and disseminate new knowledge because the exhibition got them started. Surely, this outcome is one that is both ‘culturally sound’ (I’m not even going to try and define that in the current widget-centric economic environment) and a measure of a ‘successful exhibition’ (for those needing to tick the ‘bums on seats’ box). Image one: The multi-user experience. How will it change the museum experience for your visitors? Image four: A simple and effective example. 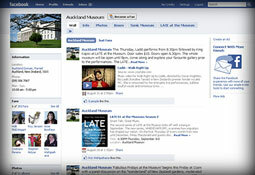 Auckland Museum uses Facebook to promote its exhibitions. Visitors to the recent ‘Wonderland: The Mystery of the Orchid’http://www.aucklandmuseum.com/?t=1039 exhibition could make their own (digital) hybrid orchid http://www.vimeo.com/6580702 and distribute it across the web. 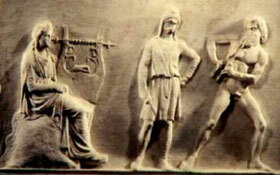 Image five: Apollo vs Dionysus. No it’s not the latest club anthem from The Ministry of Sound Annual. But the ancient Greeks and Egyptians could party almost as well as they built libraries.